Dalliance, or "Delaney", is our foundation broodmare. 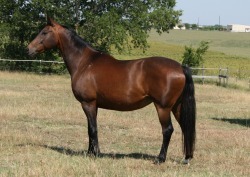 She is a beautiful, modern type mare that we added to our program in 2007. She is in the main mare book of the GOV and in the premium mare book of the ISR/OLD. She has had two premium colts . Lugana is a beautiful hanoverian mare that was high point hanoverian champion of her 2001 Mare Inspection. She is elite eligible and is also approved ISR/OLD, BWP and RPSI. She was a premium mare with the RPSI. 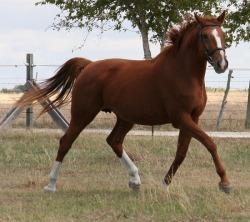 She has produced several foals by the stallions, Rainbow, Stedinger and SonntagsKind, and Furst Klasse.